DE L'ISLE -Theatrum Historicum..Romani tu Barbarorum..
DE L'ISLE,G. - Theatrum Historicum..Romani tu Barbarorum..
Theatrum Historicum..Romani tu Barbarorum.. - DE L'ISLE,G. Map maker : DE L'ISLE,G.. Size : 18.9 x 39.0 inches. / 48.0 x 99.0 cm. 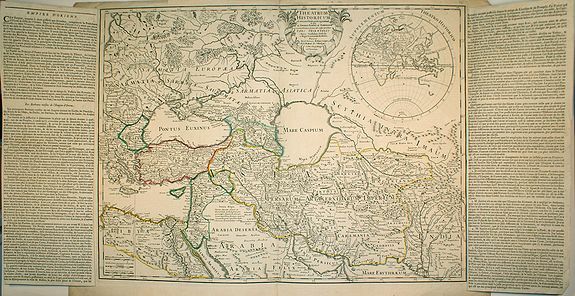 Description :Showing the Roman Empire by G. de l'Isle, French cartographer, pupil of Cassini, called Father of Modern Geography. In upper right hand corner western hemisphere including an incomplete Australia. Two additionnal folding sheets of text in french have been added on both sides of the map, with the title "Empire d'Orient". Engraved by Des Rosiers. Condition : Nice and dark print. A few visible repairs on the the margins at the back of the map and along the rim that attaches one of the folding sheets of text to the map.